It had been a few years since the last SCB yeast trial so we thought it was time to try it again. 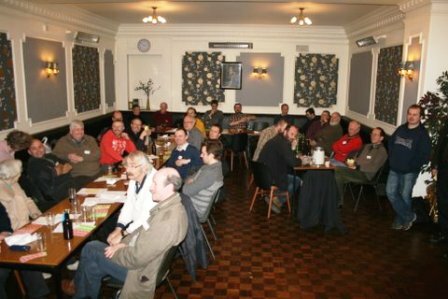 We selected the January meeting as traditionally it is a well supported meeting and we were sure that this type of experiment would attract some of the local brewers. However we were surprised when the meeting actually attracted 37 with many new faces making up the numbers. It is a long while since the SCB have managed to boast of such a well supported meeting (in fact the meeting was so popular that Davie Martin had to nip out to the shops as he was worried that there was not enough food for lunch). After an initial welcome we invited Robbie Pickering up first to talk about “Glasgow Beer Week”. Robbie is engaging with commercial and craft brewers to run a week of beer related events in Glasgow at the end of May, which will hopefully culminate in a “Pop Up” pub. More information will be forthcoming and we will be helping to promote the event through the SCB website. Next on the agenda was Duncan King, the SCB yeast enthusiast, who brought some of his home lab equipment and did a “show and tell” on inoculating slants & petri dishes for the propagation of yeast. This was followed by a Q&A session and discussion that was quite lively. We then moved onto the Yeast Trial proper. We had managed to recruit five volunteers who brewed the same recipe but then employed a different yeast. We wanted this to a be an informal tasting that would allow the participants to relax, sample the beer on offer and provide scoring and feedback on the yeast. 50g Challenger Bittering, 20g Fuggles Aroma. We wanted to ensure that the beer was of a “neutral” nature so that we we could determine the flavour characteristics and not be blinded by big flavours from either malt or hops. It was agreed that the beer is not something that any of the volunteer brewers would do again (unless there was another trial) however it met our purpose on this occasion. The yeasts were chosen as they are popular with brewers and are all readily available from the homebrew retailers (although you may need to pre order the liquid yeasts). So we decided on Safale US-05, Muntons Gold, Nottingham, WYeast 1318 (London Ale III) & WYeast 1098 (British Ale).The information below is the published information on each of the yeasts and this information was also given to the brewers on the day. We used the scoring system adopted by the BJCP (Beer Judging Certification Program) where we listed the beers and listed four categories (aroma, mouthfeel, flavour and overall drinkability) and allowed each beer to be scored out of 47. The only difference to the BJCP was that we decided to remove the clarity category. The reason for this was that the beers were being brought into Edinburgh using public transport on a Sunday morning so we expected that the cornelius kegs would be shaken up a bit and the presentation on the day may not actually be a true refection of the beer. We collected the results and we received a total of 30 completed sheets which I believe says a lot about how much the participants enjoyed the experiment. The differences in the scores given by the participants was quite marked with some being very critical of the beers and some giving more generous scores. What was noticeable however was that there was a general theme running through the scores and that we could make some clear conclusions. Overall the yeast that received the best results across all the categories was the WYeast 1318 (London Ale III) but is was closely followed by WYeast 1098 (British Ale). Both of the liquid yeasts were clearly preferred to the beers made with the dried yeast. The Nottingham and US-05 ran each other very close with the US-05 having as clear advantage on the Aroma but with Nottingham shading the Flavour category. Perhaps this is a indication of the heritage of the yeasts and with US-05 being an American Ale yeast and Nottingham being a traditional British Ale yeast. Finally bringing up the rear was the Muntons Gold which recorded the lowest score on all fronts and although there were some positive comments it was clear that many did not enjoy the beer at all. Good clean taste, lets hops through very well. Complex aroma, more hops, ripe fruit. WYeast 1318 By far the best beer. Bitter, astringent, puckering. Smooths out over time. The conclusion from this rather small experiment is that the majority of the participants preferred the beers that had been made with the liquid yeasts and generally the comments in the hall and also on the completed form back this up. However there were a few dissenting voices who did not believe that the difference was worth the extra investment. Finally, thanks go to Davie and Eileen Martin and Rab Cowan for providing a fabulous lunch for everyone who attended and helped to make it such an enjoyable event.